Jennifer Gardner is celebrating World Stroke Day today by being back at work at the University of Wisconsin Law School. Doesn’t sound that exciting? Well, consider that almost exactly a month ago, the 47-year-old accountant suffered a major stroke while walking up Bascom Hill for a meeting in Bascom Hall. Hers is a story of good fortune, and nearly everyone (except maybe her) doing the right thing. The first thing that went right on September 28 was that Jennifer was at work at all. Normally on Friday, she works from home in rural Rock County. Her husband of less than a year, Don Brokmeier, had plans to go hunting, so she would have been home alone. When she got back to the law school, she thought she’d go back to her office, shut the door and rest. Luckily, co-worker Adam Bushcott noticed something seemed off. Co-worker Kelly Hallmark had a family member who suffered a stroke recently, and she recognized the symptoms immediately. She instructed Bushcott to dial 911 while trying to keep Jennifer calm by continuing to ask her questions. A third co-worker, Vicky Coulter arrived and tried to keep Jennifer calm by letting her know she was going to be okay. Coulter spoke with UW Police, and went outside to wait for the ambulance. While they waited, Jennifer wanted to call her husband, so Hallmark got on the phone, and explained that Jennifer was likely having a stroke. He got in the car and raced towards Madison as Jennifer was on her way to University Hospital in an ambulance. There, she had a brain scan and was evaluated by stroke neurologist Dr. Natalie Wheeler. Jennifer remembers being asked questions and walking into the wall when she tried to walk. “The scariest thing was that I knew everything that was going on, but I couldn’t communicate,’’ she says. Niemann threaded a device up the blood vessels from the thigh to the brain, and was successful in grabbing and removing the clot. This restored blood flow to the brain and saved Jennifer’s brain cells. Jennifer figures she had the stroke about 1:15 p.m. and was at the hospital before 2 p.m. By late afternoon, she was sitting up in bed and talking normally. Her husband, Don, served with the Whitewater Fire Department for many years, and knows how fortunate she is. 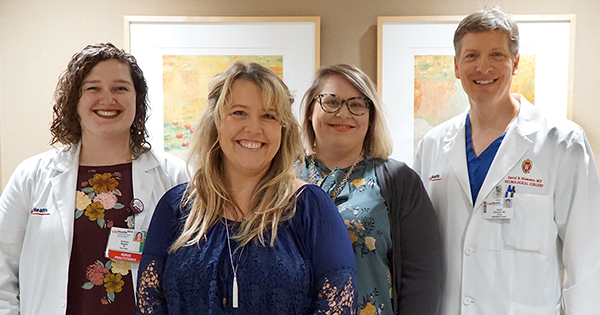 Torrie Wepfer, NP, who took care of Jennifer in the hospital and saw her last week in the outpatient clinic, attributes her strong recovery to getting to the hospital in time. And Jennifer’s advice to others?